(l-r) At Outfest: Nicole Bilderback receives her Best Lead Actress Award. Singer/songwriter Matt Alber tunes up for a live performance of his song, "End of the World," featured in THE NEW TWENTY, while the film print is tested behind him. Watch the clip from THE NEW TWENTY featuring Matt Alber's "End of the World." (l-r) THE NEW TWENTY poster is featured at the AMC Theater at the Ft. Lauderdale International Film Festival, where Chris Mason Johnson won the “Best Director, First Time Feature” award. 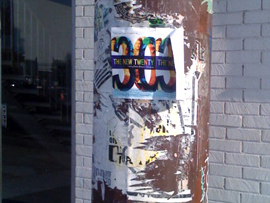 Grassroots marketing in Los Angeles: a flier for THE NEW TWENTY joins a street collage in Silverlake, promoting screenings at Outfest.